Actually, both of the FOs I have to show you were finished in March so technically I'm still good and what's a few days between friends? 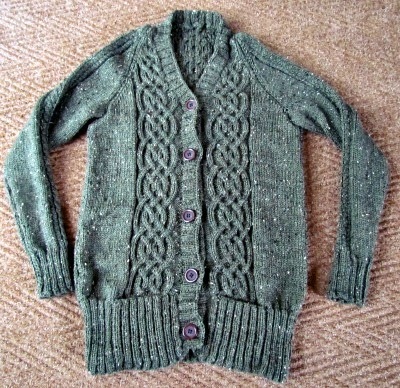 My second FO is a cardigan. 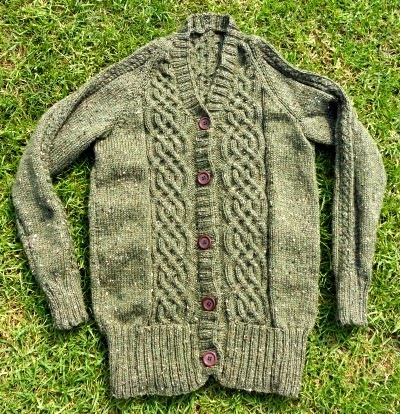 Now, I've got a bit of a 'thing' going with cardigans at the moment and I'm rather afraid it's my age cos I'm going thru the menopause and sweaters just don't work with the hot flushes! 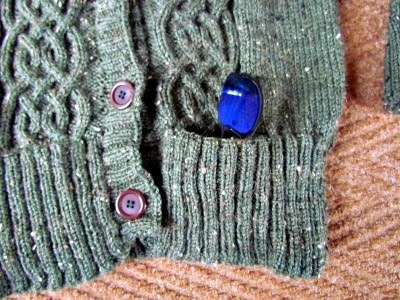 However, cardigans are GREAT! When the flushes hit I can simply open a cardi for a little ventilation and close again when the flush is over. How convenient! Also, cardis don't mess up one's hair when one takes it off you understand, although I've NEVER been one of those women who pfaff (is that even a word or just a sewing machine manufacturer?) with their hair. Mine gets a bit of a ruffle after my shower in the morning, a quick comb through and that's it until next time! Still, any item of clothing that doesn't involve going over the head on removal is all good in my opinion! I wanted something a bit countrified (again, is that a real word? 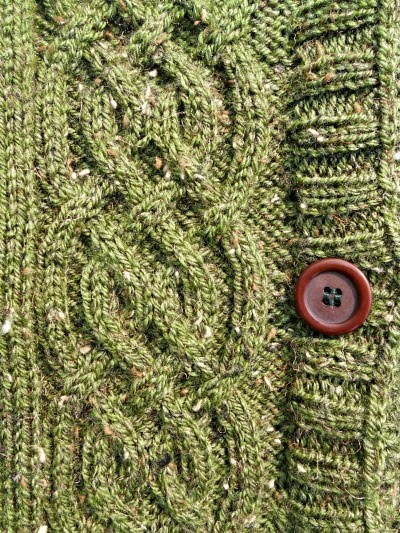 ), a bit tweedy but without being too chunky. South African winters can get chilly but never really arctic. 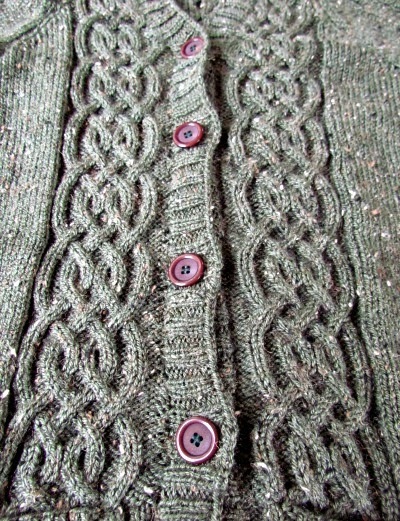 This particular cardi is another Glenna C pattern, called Rustique although I've modified it somewhat. 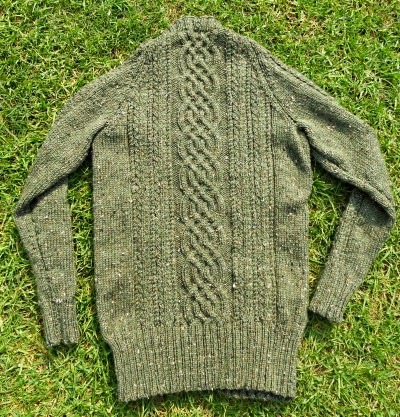 Glenna's version had a shawl collar which I've omitted as shawl collars are too much for even the coldest South African winters and a different cable pattern up the front. 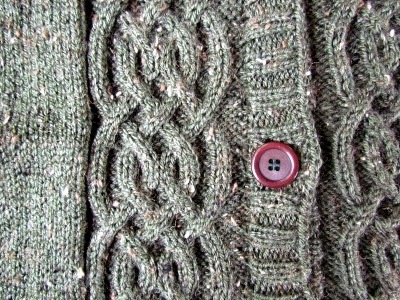 I wanted something a little more Celtic so changed the pattern to incorporate a Celtic knot cable. Please excuse the pics but it's a miz day here so even outside the light was rubbish! Anyway, here she is in all her finished finery! Did you notice the secret pockets I put in? I stuck my youngest son's mirror sunglasses in the pocket to make it a bit more obvious - by the way, you HAVE to have mirror sunglasses when you're pretending to be a secret agent (apparently)....personally they make me feel really old as we used to wear them back in the 80s as a very trendy accessory! Well, that's it for now. Am finishing off a blanket for TV watching and a baby cardi for a friend of mine so I may well be back within the month to show those off! Goodness, two posts in one month! I may have to go and have a lie down in a dark room for a bit!